General rule: All employees are protected by the following Wage and Hour, Overtime, and Compensation laws. An employer must pay an employee at least the minimum wage. The right cannot be waived by an agreement with the employer or by a collective bargaining agreement. See Cal Lab Code §§ 219, 1194. The minimum wage for California is $8.00 per hour. Cal. Labor Code § 1182.12. The federal minimum wage presently is $7.25 per hour. 29 U.S.C.S. § 206. If "an employer discharges an employee, the wages earned and unpaid at the time of discharge are due and payable immediately." Cal Lab Code § 201. 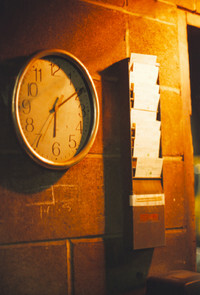 If an employee, without a written employment contract for a definite period, "quits his or her wages shall become due and payable not later than 72 hours thereafter, unless the employee has given 72 hours previous notice of his or her intention to quit, in which case the employee is entitled to his or her wages at the time of quitting." Cal Lab Code § 202. If the employer "willfully fails to pay" any wages, the wages "shall continue as a penalty from the due date thereof at the same rate until paid or until an action therefor is commenced; but the wages shall not continue for more than 30 days." Cal Lab Code § 203. For an employer to credit meals and/or lodging against the minimum wage paid to the employee, there needs to be a voluntary written agreement between the employer and the employee. California Department of Industrial Relations Minimum Wage Order MW-2007. $37.63 per week for a room occupied alone. $ 31.06 per week for a room that is shared. If it is an apartment occupied alone then 2/3 of the fair rental value of the apartment and no more than $451.89 per month. If a couple are employed by the employer and share the apartment then 2/3 the fair rental value of the apartment and no more than $668.46 per month California Department of Industrial Relations Minimum Wage Order MW-2007. Employers or agents shall not "collect, take, or receive any gratuity" or deduct any gratuity amount from an employee's wages, that has been given, paid, or left for an employee. Cal Lab Code § 351. Employees are entitled to one day off in a seven day work week. Cal Lab Code § 551. This does not apply to employees who work less than 20 hours a week or less than six hours in one day. Cal Lab Code § 556. At the time of payment of wages, an employer must provide each employee an accurate itemized statement in writing showing (1) gross wages earned; (2) total hours worked by the employee (unless exempt); (3) any overtime hours worked and applicable overtime pay rate (4) all deductions; (5) net wages earned; (6) dates of the pay period; (7) all applicable hourly rates in effect during the pay period and the corresponding number of hours worked at each hourly rate by the employee. Current and former employees have a "right to inspect or copy the records pertaining to that current or former employee, upon reasonable request to the employer." Cal Lab Code § 226. Employers who receive "a written or oral request to inspect or copy records.....pertaining to a current or former employee shall comply with the request as soon as practicable, but no later than 21 calendar days from the date of the request." Cal Lab Code § 226. Failure "by an employer to permit a current or former employee to inspect or copy records" within 21 days, "entitles the current or former employee or the Labor Commissioner to recover" a $750 penalty from the employer. Cal Lab Code § 226. An employee injured by an employer's failure to comply with the above is entitled to recover the greater of all actual damages or fifty dollars ($50) for the initial pay period in which a violation occurs and one hundred dollars ($100) per employee for each violation in a subsequent pay period, not exceeding an aggregate penalty of four thousand dollars ($4,000), and is entitled to an award of costs and reasonable attorney's fees. Cal. Lab. Code § 226. "receives approval in a secret ballot election by at least 2/3 of the affected employees in a readily identifiable work unit." Cal Lab Code § 511. "the proposal for an alternative workweek schedule" must also be "in the form of a written agreement." 8 CCR 11160. If an employee works hours in excess of the alternative work week schedule, above 10 hours a day or above 40 hours a week, the employee is entitled to overtime compensation at 1 times the regular rate of pay of the employee. Cal. Lab Code § 511. If ane employee works in "excess of 12 hours per day" the employee is entitled to overtime compensation at the rate of "double the regular rate of pay of the employee." Cal. Lab Code § 511. If you and other employees have not been granted minimum wage, have had credits against your wages unfairly applied to you, have been denied access to your employment records, or have been forced into an alternative workweek or have not been properly compensated for working alternative work weeks, contact the renowned wage and hour lawyers at Kokozian Law Firm, APC. 323-857-5900. Ask about our free initial consultation.